Whether we like it or not the holidays are coming. And, like it or not we might have snoopy Suzies going through our medicine cabinets. If nothing else, there a good chance that one of our guests along the way will take in a little too much Charlie Brown or egg nog...and need an aspirin. When is the last time you cleaned out your medicine cabinet? Take 31 Minutes today and purge, like we did with our spices and our dreaded junk drawers. Dump all the expired medicines. Some say not to flush them. Others say not to toss them in the trash. You make the call. Once you've purged, here's how I organize my cabinet. I start with the tallest items. Can I store them under the sink? Anyway, my giants live under the sink. Do you have lots of little things, makeup, Ben-gay, ointments, that are short? Do you reach for them often so they should be on the bottom shelf? (See how I'm assuming you're short like me?) Or, should the the taller stuff be on the bottom? Then take the tallest and measure from the top or bottom - depending on what you decided. Put in that shelf and fill it with all the stuff that is the tallest. Then, take the next tallest and do it again. Till your down to the tiny stuff, and that can be on a micro shelf - since really that's all it needs. Yeah, I realize I keep wavering between first person and second person narrative. I'm okay with that...lol. I keep a "Health" container in the pantry. It's shoebox sized and holds things like cough syrup, expectorants, band-aids, cough drops, pocket-sized tissues. You get the idea. When we start sniffling, I pull out the box. But, when we are healthy, it's put away so we have lots more room in the medicine cabinet. 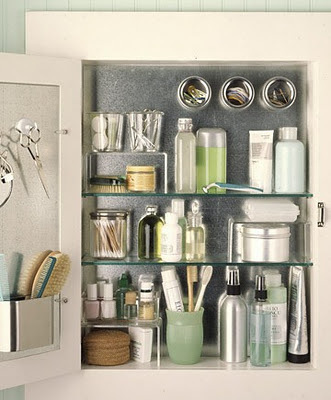 What tips do you have for keeping an organized bathroom?